As you may, or may not know, I looooooooove shrimp and grits! While my earlier recipe on here is one of my all-time favorites, this one is simply delicious. I was watching The Chew on Friday, and Carla Hall made a dish called “Swamp Thing”, which was her healthier version of shrimp and grits. Once I saw it was loaded with vegetables, I was sold, and knew I had to try it, which I did later that day with a few small modifications. This recipe does take a little effort, as the grits need to be made about an hour beforehand, and there’s a decent amount of veggie chopping, but trust me when I say, it’s worth it! Thanks Carla!!! In a medium saucepan, bring water, Half & Half, and corn to a boil. Slowly whisk in grits, avoiding lumps and cook according to package directions. Once cooked, whisk in butter and cheese (if using). Pour into greased baking dish, allow to cool, then place in refrigerator for an hour. At this point, you can start on the stew if you want & come back to step 6. Remove grits from fridge and cut into 3 inch squares (or desired size). Heat a non-stick pan over medium-high heat with olive oil. Fry grits in hot oil until golden on all sides. Remove from pan. In a heavy bottomed pot, over high heat, add olive oil. Toss in the onions and garlic and cook for about 3 minutes. Toss in all the other vegetables except for the collard greens and crushed tomatoes, and add olive oil if it seems dry. Coat all the vegetables in oil and continue to cook over high heat, just slightly browning everything. Sprinkle flour over the vegetables and stir. Deglaze with the chicken stock. Add the collard greens, thyme, bay leaf and cayenne, and stir. Add in the tomatoes and bring to a boil. Reduce to a simmer and cook until the vegetables are cooked through, about 25 minutes. Right before serving, toss in the shrimp and simmer for 2-3 minutes, or until the shrimp is just cooked through. Plate in a soup bowl on top of fried grits. Season to taste. Serve immediately. * To ribbon the collard greens, take some leaves, place them on top of each other, roll them up long-way, and cut small pieces off of the ends. This will form long, thin pieces known as ribbons. Note: If you don’t do shrimp/shellfish, you can definitely leave it out. Also, feel free to substitute vegetable broth in place of chicken broth. 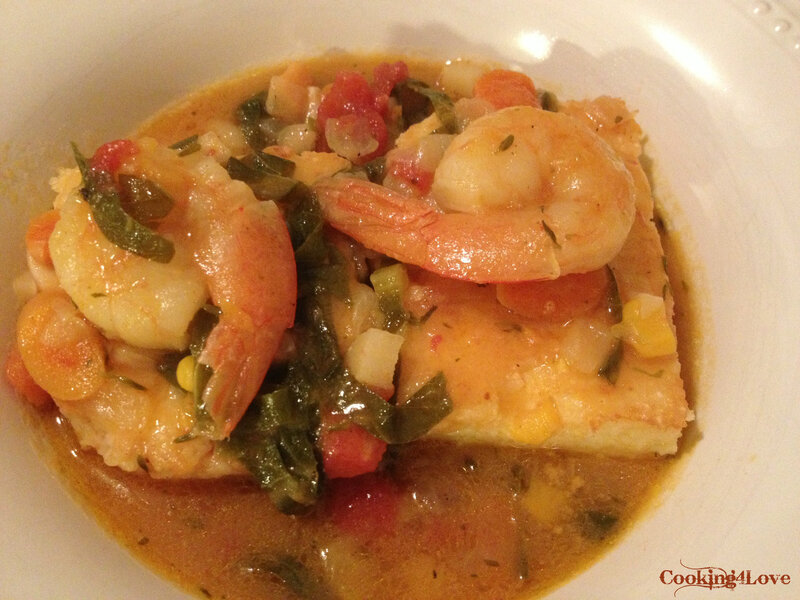 This entry was posted in Fish / Shellfish, Main Courses / Dinner, Recipes, Soup and tagged bay leaf, carrots, chicken broth, collard greens, corn, garlic, grits, onions, parsnip, plum tomatoes, shrimp, sweet potatoes, thyme. Bookmark the permalink.